Jacobs Funeral Homes & Cremation Services, Inc. is proud to be able to offer pet loss services to our community with the same high standards we abide by every day for our human family, friends and acquaintances. In addition to offering immediate response and dignified pet cremation services, we offer special pet tribute products and other grief support materials to make the major life passage one of meaning and significance. 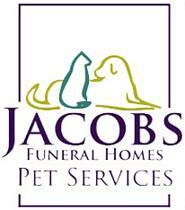 Jacobs Funeral Home & Pet Services is a Licensed Affiliate of Pet Passages. Pet Passages is a trademark of Pet Passages, Inc.